2. (Alchem.) Gold; — so called from its brilliancy, color, and value. –Chaucer. As any she bely’d with false compare. I was accosted late one night on Highgate Hill by a staggering drunk…[he] demanded of me threateningly, “How beautiful is the moon?”… Thinking quickly and not wishing for an early toxic death, I fixed him with my eye and declaimed, “My mistress’ eyes are nothing like the sun.” Shakespeare is always useful I’ve found for calming down violent drunks if only because it gives them the impression that you’re crazier then they are…. 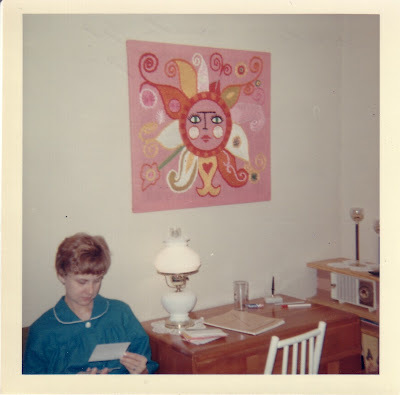 My mother made the picture that hangs on the wall in the photo below. It was in their Houston apartment when they were newly married; many years later it was banned to the basement TV room; now it no longer exists, having made its way to the garbage dump when my parents ruthlessly cleaned house before moving to a new destination. My siblings and I loved this sun; it was so vintage; so…pink! At least it is still preserved in our photo album, and now as part of Funky Foto Flashback!